In printing, wooden blocks, stencils, engraved plates, rollers, or silk screens can be used to place colors on the fabric. Colorants used in printing contain dyes thickened to prevent the color from spreading by capillary attraction beyond the limits of the pattern or design. The leather to which the application of the present invention is particularly suited is one which preferably has no mineral salt content and is one produced using naturally occurring dyes and tanning materials. However, the invention is applicable to leathers having a very light mineral salt content which advantageously does not exceed 5%. It is believed that a leather having a salt content greater than the stated upper limit will be less receptive to the printing process of the instant invention, since the salt will resist the acceptance by the leather of the ink or dye. However, it is possible to employ leathers with a mineral salt content in excess of the 5% level. The leather may be provided with a surface coating with the printing being effected on the surface carrying said coating. The surface coating may be a water-based paint. The removal of the backing layer of the inkjet transfer sheet and of the residual film is an important step in terms of restoring the surface of the leather piece to a natural texture both in tactile and visual senses. As indicated supra the surfactant used for this removal step is conveniently one which is capable of removing water-based paints. The duration of the heating step and the temperature at which the heat transfer occurs is dictated by the nature and physical characteristics of the leather piece being printed, eg its thickness. For example, the heating step may last for a period of 15 seconds at a temperature of 180°C, but variations both temporally and in temperature level may be made according to the leather piece or strip being processed. The pressing of the transfer paper onto the piece or strip of leather as indicated above may be carried out simultaneously with the heating step, and one example of press is that of a platen caused to contact the transfer paper which in turn is in contact with the relevant surface of the leather piece or strip. 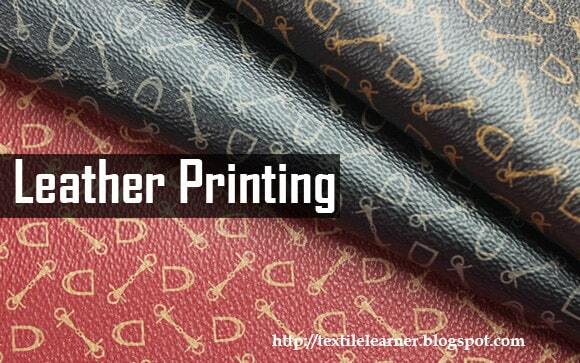 A process for printing on leather includes the steps of generating a digital, monochromatic or polychromatic image, printing the image on inkjet transfer paper, pressing the image onto a leather piece, and removing the backing layer of the transfer paper. Accordingly, a process for printing on leather includes the steps of preparing an image of monochromatic or polychromatic character, printing the image using one or more inks or dyes onto a sheet of transfer paper having a backing layer, pressing the transfer paper onto a piece or strip of tanned leather to transfer the said image, and removing the backing layer of the transfer paper. In one alternative method, a swiping action may be adopted whereby pressure is applied to a blade which traverses the backing layer and occasions an even but gradual movement over the area of the leather. In a further alternative method of applying pressure, a roller system may be used with a gradual movement being afforded thereby avoiding the problems of air or moisture pockets forming. Designs are printed on leather material using several techniques like heat press, digital printing etc. We use multi-colors to make the product look attractive. The colours are of high quality and do not fade with time. They are long lasting and durable. The sheet bearing the printed image is then pressed onto a piece of leather which has been tanned. The next step in the process involves the removal of the backing sheet which may merely be stripped away either when cold or hot. The removal of the residual film left after stripping away the backing layer may be effected by means of the application of a surfactant which is a textured water-based paint remover. The removal of the film restores the tactile and visual characteristics of the leather, but it is advantageous to apply heat to the leather in order to refix the inks or dyes. The resulting leather piece has the normal appearance and tactile qualities of unprinted leather but carries the print image generated digitally by computer, the image being fixed in the fabric of the leather. In order to avoid the creation of air pockets and the possible generation of moisture which might adversely affect the process steps, the application of the platen is effected in such manner as to secure that there is substantially no air or moisture trapped between the platen and the backing layer of the paper. The removal of the backing layer of the transfer paper generally leaves a residue in the form of a film of water-based character which can be removed by the use of a suitable surfactant. The surfactant tends to re-hydrate the film which enables its removal by simple wiping. It has been found that a degree of heating of the surfactant enhances its removal properties enabling a swifter removal of the film. Advantageously the leather piece or strip carrying the image is heat treated to fix the inks or dyes into the body of the leather piece. It is, however, to be understood that the heat treatment step may not always be necessary. The heat treatment step may be conducted simultaneously with the pressing step. The image may conveniently be digitally generated and stored. The transfer paper may be inkjet transfer paper obtained from a commercial source. The leather piece or strip may be further treated following the heating step in order to restore its drop characteristics, ie its ability to fall easily from the point of suspension, or in essence its pliancy. Such treatment involves a physical massaging of the leather and may be achieved by conventional means used in the leather making industry.